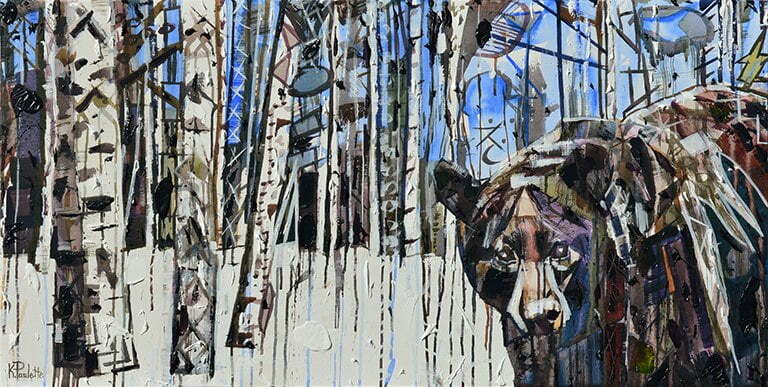 Bear in the Birch Trees is a contemporary wildlife art painting for sale by Kent Paulette. The expressive black bear is standing on white snow with white birch or aspen trees in the surrounding winter landscape. The bark of the trees is peeling. There is a blue sky above the wild animal which is made up of abstract geometric shapes. K. Paulette (aka Derfla) used a palette knife on this abstract bear art to apply the thick texture and his signature Ninja Splats. The style of this fine art is Cubism, Expressionism, and Paulette’s own unique style. Buy this modern art in small & large sizes on canvas. The dynamic brushstrokes that Paulette used give this bear painting on canvas the quality that it’s pulsing with life but at the same time it is very calming. Paulette loves to paint animals in the wild surrounded by their natural environment such as this winter landscape with snow. Boone, NC artist Kent Paulette painted this nature scene in December 2015. He also has bear paintings in Banner Elk, NC at Studio 140 next door to Sorrento’s Bistro.